A self assembly log horse with chainsaw support. 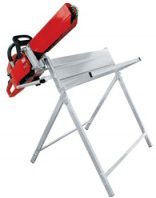 Please note that the chainsaw shown on the illustration is not included. Delivery of this item is FREE to mainland UK addresses (Highlands and Islands extra). Delivery normally 2/3 working days from order.